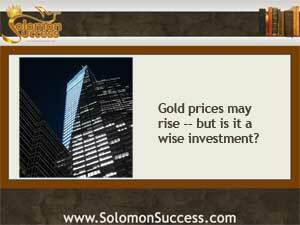 Solomon Success > Blog > Is Gold a Prudent Investment Today? In his many proverbs about what’s important in life, King Solomon reminds us that wisdom and prudence rank far above worldly riches, silver and gold. Today, too, as the price of gold continues to fluctuate, market watchers are raising questions about the place of gold – and the so-called “gold standard” will have in today’s financial world. Gold itself isn’t a convenient form of currency of course, but for centuries it’s stood as the backbone of money markets round the globe – hence the term “gold standard.” But a variety of factors govern the valuation of gold: availability, scarcity and demand. And in an age when the very concept of what money is can be challenged by the rise of digital currencies that share those features, some observers speculate that the gold standard may not have much meaning in the not too distant future. Gold prices have had a rocky ride lately, with prices dropping and international demand for the metal declining in markets including India and China – one of the world’s leading gold importers. But according to a new report on the financial site Money Morning, some investing insiders are predicting that the price of gold will rise considerably in 2014 and beyond, fueled by changes on the international scene and economic concerns at home. China, a longtime leader in the gold trade, is increasing its purchases. Likewise, India, whose curbs on gold imports had been partly responsible for the metal’s decline, has relaxed those limits and opened channels for more imports. And back in the US, concerns about the recent government shutdown and the Federal Reserve’s mixed messages about the tapering down of its stimulus program have driven wealthier investors back to the precisions metals, particularly gold. But the volatility of gold, once the icon for financial prosperity and stability, leaves some market watchers skeptical that it can remain so in the long term. The world is changing, and the emergence of digital currencies such as the Bitcoin and Feathercoin are forcing a change, too, in the way people think about money and what monetary standards really mean. As more and more transactions move into the digital realm, what role does gold really fill in a world where there’s no need to “back” currencies with physical commodities? Silver: More Precious Than Gold in Metals Markets? Silver: More Precious Than Gold in the Metals Markets? Wisdom is Worth More Than – Palladium?